New engines for Peugeot 407 Coupe | What Car? 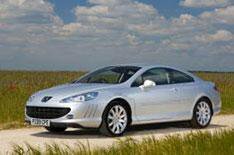 New diesel engines and updated styling boost the Peugeot 407 Coupe's appeal. Peugeot's most powerful production car engine ever will be used in the updated 407 Coupe. The 241bhp 3.0-litre HDI diesel engine brings 18% more power than the 2.7 HDI unit it replaces. Emissions are dramatically slashed, with CO2 output cut from 225g/km to 189g/km. Fuel economy is also improved, with an average of 39.2mpg. A six-speed automatic gearbox comes as standard. For less cash, the new 2.0 HDI engine still produces 163bhp, which is 20% more power than the engine it replaces. CO2 emissions drop by 8.5% to 140g/km and a six-speed manual gearbox comes as standard. The previous 2.2-litre petrol model has been discontinued. There's updated styling, too, with the 407 Coupe getting larger, redesigned door mirrors, and chrome trim that spans the entire upper section of the side windows. The V6 HDI gets twin oval exhaust pipes on either side of the rear bumper. Prices have increased slightly, though, with the 2.0 HDI at £22,990 and the V6 HDI priced at £27,490. Both models are on sale now.